New York City’s St. Patrick’s Day Parade starts on 44th St. and goes up Fifth Ave. to 86th St. The parade starts on 44th St., but Fifth Ave. will be blocked at 42nd St. Authentic Irish Pubs just a few blocks from the parade route. In the 40s: (you gotta pick a side, east or west, because crossing 5th Ave. will be extremely difficult if not impossible). Maggie’s Place will be celebrating their 35th parade this year. They are less than a block away away from the parade route. Also, congratulations to our friends Martin & Kara Whelan on the birth of their baby girl, Chloe last week. 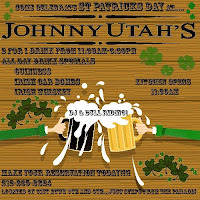 Johnny Utah’s, the bar with the mechanical bull. On the east side of Fifth Ave. the action is all the way over on Second Ave.